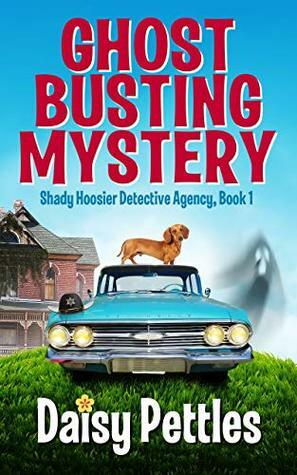 Ghost Busting Mystery by Daisy Pettles is the first book in the cozy Shady Hoosier Detective Agency mystery series. This one is for the fans of the over the top humorous cozies that keep a reader laughing from start to finish. Our two main characters of Ghost Busting Mystery are a couple of “elderly” ladies, Ruby Jane Waskom and Veenie Goens. Best friends all their lives the pair lean on each other with neither being rich and still needing to work to support themselves they have taken on working at the Shady Hoosier Detective Agency, what better job to put to use their nosy natures. Things have been a bit slow at the agency and the ladies know they need to take on any case that comes their way. So from anything like searching for a blind missing wiener dog, mysterious break ins at the local shop or an abandoned mansion that is haunted by ghosts with big butts Ruby Jane and Veenie will be off to the rescue. Being from Indiana myself I just had to give this little cozy a try and I’m certainly glad I did. Sure, it could use a little polishing up a large publisher would bring but it’s still in excellent shape for a small one and the story is one that is non-stop laughs. Having spent plenty of time in southern Indiana I can honestly say there can be some pretty colorful characters in these areas and while Knobby Waters is fictional many of the other towns mentioned aren’t and I’ve been to a few. I could easily picture all of the antics and think those that enjoy a huge helping of quirkiness will love this book. Daisy Pettles is the pen name of Vicky Phillips, born in Bedford, Indiana and raised in the tiny farming community of Medora, where her parents ran the corner gas station and ice cream stand. She learned to read while sitting on her grandmother’s lap, under an apple tree in Brownstown, Indiana. As a child, she was fed a steady diet of books, pies, and Bible stories. After graduating from Medora High School in 1977, she attended DePauw University, where she was graduated Phi Beta Kappa. A world traveler, she has lived in San Francisco, London and Athens. She has raced camels in Egypt and eaten Kentucky Fried Chicken with Communists in Shanghai. She was a therapist before becoming an Internet entrepreneur, designing America’s first online university counseling system in 1989. She currently lives in a cloud of peace and quiet at the end of a dirt road in Vermont. For all her travels, she remains a Hoosier at heart. She loves persimmon pudding and feel-good stories where Good stomps all over Evil. The Shady Hoosier Detective Agency, a humorous crime cozy series set in the fictitious small town of Knobby Waters, Indiana, is her debut mystery series. Sounds like a promising beginning to a new cozy series. Nice review Carrie.